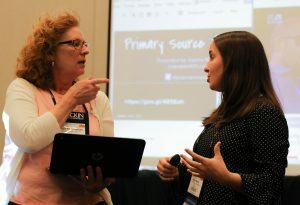 Joanna Marek, right, talks with an attendee at the AASL 2017 National Conference. Picture books offer a tremendous amount of learning opportunities. Joanna Marek, the school librarian at Spring Avenue Elementary School in La Grange, Illinois, appreciates this fact. After attending a weeklong institute at the Library of Congress, Marek was inspired to create teacher guides that match award-winning books with primary sources. She freely shares her work on Primary Source Pairings to give teachers and librarians lessons they can use tomorrow. A primary source is the raw material of history created in the time of the study. Some examples include pictures, maps, video clips, recipe cards, cartoons and drawings. 1. Observe: What do you notice? Look at the image. State what you see. 2. Reflect: Activate prior knowledge and infer what you see. 3. Question: Ask questions about what you see. Build on observations and reflections. Primary Source Analysis Tool from Library of Congress. Use this online tool for grades K-12 to document thinking when looking closely at primary sources. This three part process is versatile and easy to use. Teacher Resources from Library of Congress. 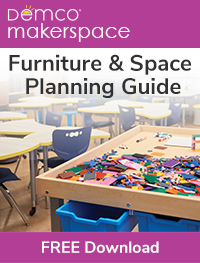 Bookmark this website to find classroom materials that cover state and national standards for grades K-12. Learn How to Teach with Primary Sources. The Library of Congress offers webinars, workshops and summer teacher institutes to learn more about teaching with primary sources. Common Core in Action: 10 Visual Literacy Strategies. This relevant blog post, by Professor Todd Blake Finley, offers accessible resources that you can use in your library today. 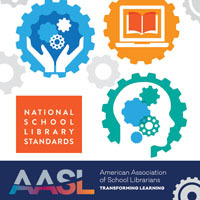 AASL Standards Framework for Learners. Refer to this easy-to-follow chart when designing lessons and collaborating with teachers. 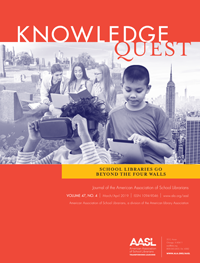 Visual literacy lessons cover AASL standards l.A.2, ll.B.2, l.B.1, and V.A.1. See Joanna Marek’s AASL 2017 presentation on the AASL eCollab learning platform. 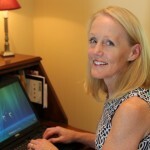 If you have ideas to share or questions for Joanna, contact her on Twitter: @joannammarek. Thanks for these great resources Maureen! !